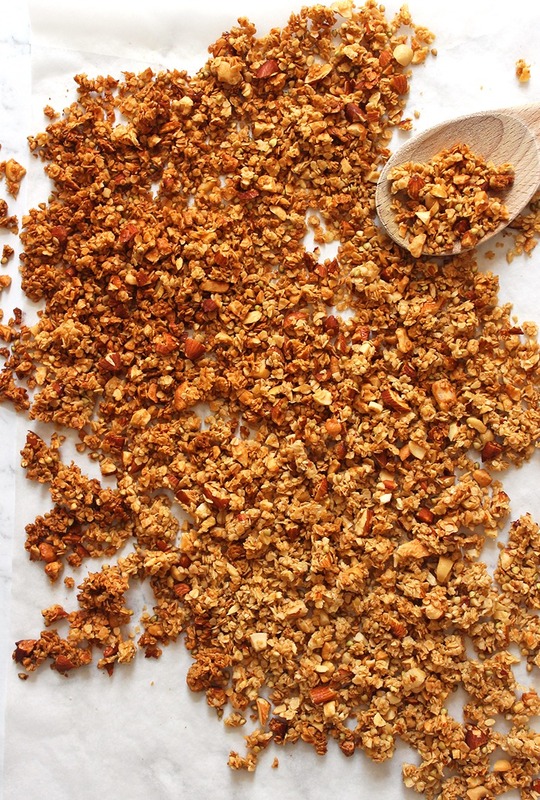 After super simple and delicious granola that you can whip up yourself? Well, you’ve come to the right place! 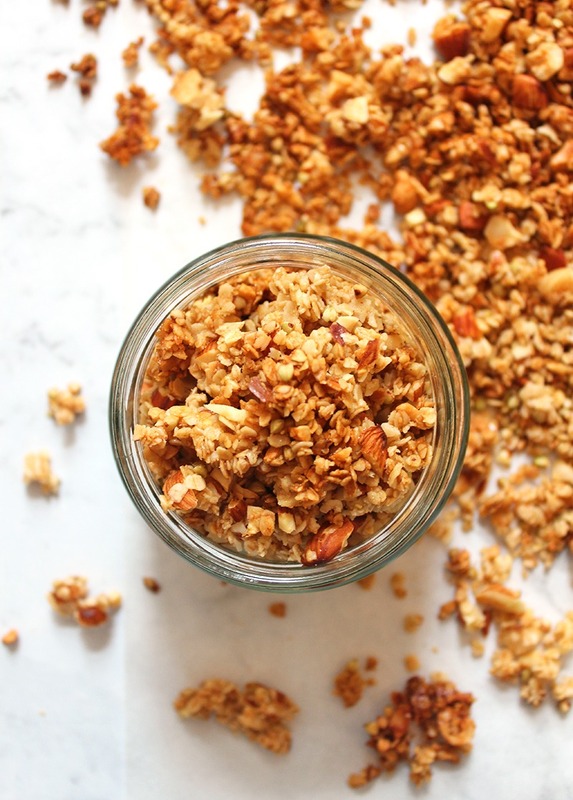 This Maple Granola recipe is only 9 ingredients, quick to prepare and super tasty. It makes 6 cups of granola so it’s perfect for weekly meal prepping or making fresh if you have the luxury of time in your mornings… lucky! To start, we chop up some almonds, cashews and brazil nuts for lots of healthy fats to fuel our brains and bodies until lunch. Mix the chopped nuts in a bowl with some oats, buckwheat groats and brown sugar. Next, we melt some coconut oil and pure maple syrup over a low heat and once melted, add some vanilla extract. This will be the sweet sticky syrup that coats our granola and forms the much-loved clusters throughout it. Once everything has been mixed together; spread it out onto a baking tray and bake it for 20 minutes or until it’s lovely and golden. Now we can take it out and let it cool, stirring half of the mixture for a nice balance of fine granola and delicious clusters. Enjoy it with your favourite plant-based milk or coconut yoghurt and top it with fresh fruit and nut butter, yum! 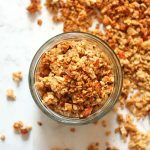 If you make this Simple Maple Granola recipe, share it with us on Instagram @LemonThy.me, I’d love to see your impression of it and how you dressed it. Preheat your oven to 180 degrees C (355 F) and line a baking tray. Roughly chop the almonds, cashews & brazil nuts. In a medium-sized mixing bowl, combine the chopped nuts with the rolled oats, buckwheat and brown sugar. In a small saucepan over a low heat, melt the coconut oil & maple syrup, once melted together, stir in the vanilla extract. Pour the wet ingredients into the dry and mix so that all the ingredients are coated and form a sticky consistency. Spread the mixture evenly onto the baking tray and bake for 20 minutes or until lightly golden. 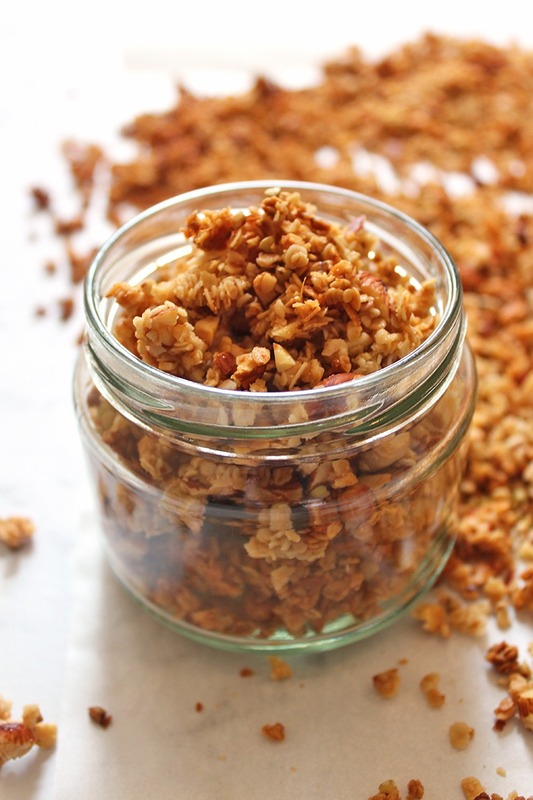 For large granola clusters, don't toss the granola until it has completely cooled and for finer granola toss periodically while cooling. OR just toss half of the mixture for a balanced granola.